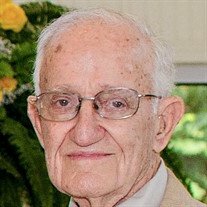 Arthur Lee Eastham, 93, of North Little Rock, went to be with the Lord on August 31, 2018. He was born on November 23, 1924 in Tahlequah, Oklahoma. He is survived by his wife of 71 years, Leola; son, Ron Eastham (Patricia); daughter, Melba Springer (Ed); six grandchildren; ten great-grandchildren; three great-great grandchildren; brother, Thomas and sister, Gladys. Art was a WWII Navy Veteran, owner of Art's Marine, former NLR Alderman, Gideon, former member of NLR First Nazarene and a member of Friendly Chapel Church of the Nazarene and founder of the Soup Kitchen Fish Fry. He was an avid fisherman and more important, he was a fisher of men. In lieu of flowers, memorials may be made to the Friendly Chapel Soup Kitchen. Visitation will be held 4:00 to 6:00 p.m. Sunday, September 2, 2018 at Smith-Sherwood Funeral Home. Funeral service will be at 11:00 a.m. Tuesday, September 4th at the Friendly Chapel Church of the Nazarene. Edgewood Cemetery in North Little Rock, Arkansas.